GHBA Prism Award 2007 Custom Home of the Year! In gated section of Falls at High Meadow Ranch (only 35 lots). 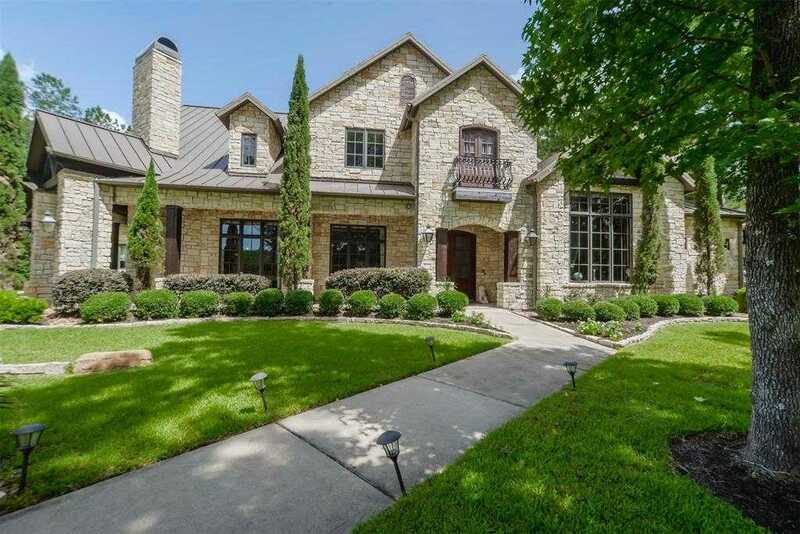 Stone & stucco home on 1.3 acres that backs onto 18th hole of golf course with covered front & back porches, balcony, carports & attached 3 car garage. Home boasts Limestone floors; beautiful ceiling features; wine room; 2 wet bars (1 up/1 down); media/game room; butlers pantry media/game room; 2 studies (1 up/1 down); 3 powder rooms; 3 staircases – 2 interior plus exterior stairs to balcony; exercise room between study & master closet; play room with mural (or storage) between 2 bedrooms; separate quarters with bed/bath; converted attic room with sink; spiral stair case with rotunda ceiling feature & library on landing; all secondary bedrooms en-suite; 2 interior fireplaces & 1 outside on back patio; whole house water softener. Elevator plans available. Additional amenities for gated section include gated entry, putting green, jogging trail, outdoor fitness area. Please, send me more information on this property: MLS# 19582418 – $1,190,000 – 28233 Meadow Falls, Magnolia, TX 77355. I would like to schedule a showing appointment for this property: MLS# 19582418 – $1,190,000 – 28233 Meadow Falls, Magnolia, TX 77355.